To achieve the best overall outcome in a lighting installation, it is important to avoid the tendency of rushing straight into luminaire selection before determining more broadly what is required from the system. The use of a structured design process helps to avoid this. The five initial stages are considered in more detail in the following lines. At this stage, consideration is given to how the light is to be delivered, e.g. will it be recessed, surface mounted, direct or indirect, or will up-lighting be used, and its primary characteristics, e.g. will it be prismatic, low brightness or mellow light. Consideration should be given at this stage to the use of daylight to minimise the need for artificial light. Once the method of lighting has been selected, the most appropriate light source can then be chosen followed by the luminaire. Photometric data for light sources and luminaires is commercially available to contribute to these calculations. There are a wide range of manual computation methods for the calculation of different lighting aspects. These include complex methods for calculating the illuminance from a wide variety of shapes of luminous objects. The majority of these have now been superseded by computer programs (check our free software). The Lumen Method was the mainstay for interior lighting and has remained in use as a quick and relatively accurate method of calculating interior illuminance. The Lumen Method calculates the average illuminance at a specific level in the space, including an allowance for the light reflected from the interior surfaces of the room. The calculation method has a set of assumptions that, if followed, gives a reasonable visual environment. Inadequate attention to the assumptions will produce poor results. The average illuminance produced by a lighting installation, or the number of luminaires required to achieve a specific average illuminance, can be calculated by means of utilization factors (UF), a UF being the ratio of the total flux received by a particular surface to the total lamp flux of the installation. The average illuminance E(h) over a reference surface s can be calculated from the “lumen method” formula. Utilization factors can be determined for any surface or layout of luminaires. The “UF” symbol is normally shown followed by an extra letter in brackets, to denote the surface, for example, UF(F) is the utilisation factor for the floor cavity and UF(W) is the utilisation factor for the walls. Utilization factors are, in practice, only calculated for general lighting systems with regular arrays of luminaires and for three main room surfaces. The highest of these surfaces, the C surface (for ceiling cavity), is an imaginary horizontal plane at the level of the luminaires having a reflectance equal to that of the ceiling cavity. The lowest surface, the F surface (for floor Cavity), is a horizontal plane at normal working height (i.e. table height), which is often assumed to be 0.85 m above the floor. The middle surface, the W surface (for walls), consists of all the walls between the C and F planes. Although the lighting designer can calculate utilization factors, lighting companies publish utilization factors for standard conditions for their luminaires. The standard method of presentation is shown below. To use this table, it is only necessary to know the Room Index and the effective reflectance of the three standard surfaces (floor cavity, walls and ceiling cavity). Hm – the height of the luminaire plane above the horizontal reference plane. If the room is re-entrant in shape, for example L shaped, then it must be divided into two or more non-re- entrant sections, which can be treated separately. The Spacing to Mounting Height Ratio (SHR) is the spacing between luminaires divided by their height above the horizontal reference plane. It affects the uniformity of illuminance on that plane. When the UF tables are determined, for a nominal spacing to height ratio SHR NOM, the maximum spacing to height ratio SHR MAX of the luminaire is also calculated, and is a value that should not be exceeded if the uniformity is to be acceptable. Although it was possible to calculate the luminance of all the surfaces in a room, the calculations were extremely laborious and could only be justified in the most special cases. However, the advent of computer modelling enabled a more flexible approach to lighting design and significantly increased the information available to the designer. This gives the lighting designer a much greater understanding of what is happening in the room. However there has been considerable research, experience and documentation over the past 80 years that has developed the current thinking in the adequacy of various illuminance levels for various tasks and functions. It is important in using a lighting calculation program that the output records the type of luminaire used, the location of the luminaires, the assumed lumen output of the lamp, the light loss factor and the aiming points. If this is not recorded you have a pretty picture of the installation and no way of making it a reality. These are programs that create a perspective rendering of the space in levels of detail that vary from a block representation of the space, to photographic quality renderings, depending on the sophistication of the program and the level of detail of the interior to be entered. The major difference being in how they interpret light from reflective surfaces. A Lambertian surface is a perfect diffuser, where light is reflected in all directions, irrespective of the angle of incidence of the light such that irrespective of the viewing angle the surface has the same luminance. A specular surface is a mirror like surface, where the angle of reflection of the light is the same as the angle of incidence. A real life surface is a combination of both surfaces (semi-specular) and has both specular and diffuse characteristics. Some materials are more specular while others are more diffuse. A flux transfer or radiosity program treats all surfaces as diffuse or Lambertian surfaces, as a result their rendering tends to appear flat with soft shadow details. It will tend to overestimate the uniformity. Ray tracing traces the individual rays of light from the source to the eye as it reflects from surface to surface around the room. As a result ray tracing can allow for the specular component of the surfaces. Some programs calculate the entire lighting by ray tracing while others calculate the space on a flux transfer basis and have an overlay of ray tracing of specific areas to improve the quality of the rendering. When ray tracing is added, reflections are added in polished surfaces and shadows become sharper. 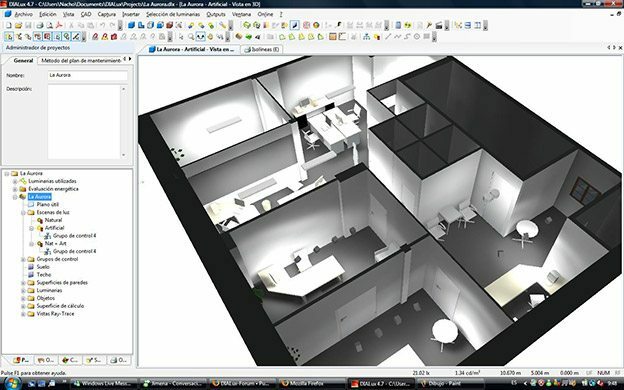 Visualisation programs are a useful tool in the presentation of a design, as a tool for the designer to check that the design is consistent with his own visualisation of the space, and to model specific lighting solutions. The programs are still calculation tools and not design programs. The programs can show the designer how a specific design will perform but that they cannot reliably be used to assess the acceptability of a design. Irrespective of the form of the visualisation output, it is important that the program provides adequate information to enable the construction and verification of the lighting design. Installation information – the type and location of all luminaires and the aiming information. The lamp details should be included as well as the specific catalogue number of photometric file that has been used. Light technical parameters – the illuminance, uniformity and other parameters that have been calculated to achieve the design. Verification information – adequate details to enable the lighting calculation to be verified. This should include the luminaire type, the photometric file, surface reflectances that were assumed, light loss factors, lumen output of lamps and mounting and aiming locations. The effectiveness and efficiency of any lighting installation is affected as much by the control system as by the light sources and fixtures chosen. Providing multiple switches to control the number of lights that come on at any one time. Using one switch to turn on all the lights in a large room is very inefficient. Placing switches at the exits from rooms and using two-way switching to encourage lights to be turned off when leaving the room. Using ‘smart’ light switches and fittings which use movement sensors to turn lights on and off automatically. These are useful in rooms used infrequently where lights may be left on by mistake, or for the elderly and disabled. Make sure they have a built-in daylight sensor so that the light doesn’t turn on unnecessarily. Models which must be turned on manually and turn off automatically, but with a manual over-ride, are preferable in most situations. Be aware that the sensors use some power continuously, up to 5W or even 10W in some cases. Using timers, daylight controls and motion sensors to switch outdoor security lights on and off automatically. controls are particularly useful for common areas, such as hallways, corridors and stairwells, in multi-unit housing. Using solar powered lighting for garden and security lights. Using dimmer controls for incandescent lights (including halogens). This can save energy and also increase bulb life. Most standard fluorescent lamps cannot be dimmed, but special dimmers and lamps are available. 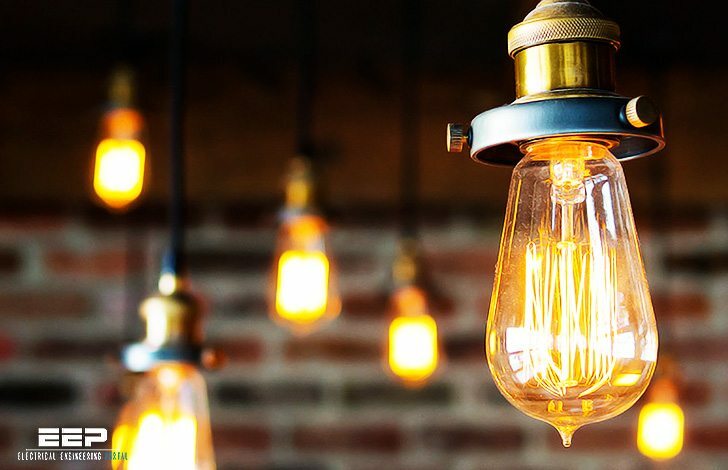 If lamps are to be dimmed it is important to ensure that the correct equipment is used, especially when retrofitting more energy efficient lamps. Funny how usually such technical articles published on EE portals, but in real life, applications are dominated by architects or interior designers. Surprised that only Dialux was mentioned and not Relux and other lighting design packages. Perhaps you should do a comparison article ? Criteria for selection of Total Light Loss factor. Amazing article how I can save it? See the blue button ‘Get PDF’ on your left? That’s your answer, create the PDF out of this or any technical article and save it. um very happy to have this article. thank you a million. Amazing information, I need this article to be sent to my email. A very informative article. Concise and complete. Wow, this is an amazingly comprehensive article on a topic that is so relevant and so confusing!